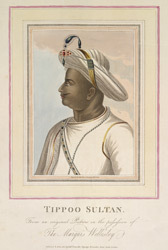 Tippoo Sultan. From An Original Picture In The Possession of the Marquis Wellesley. bl.uk > Online Gallery Home	> Online exhibitions	> Asia, Pacific and Africa Collections	> Tippoo Sultan. From An Original Picture In The Possession of the Marquis Wellesley.